Posted on October 25, 2016 by Norwich Radical	in Arts and tagged actors, BFI, CIA, cinema, Edward Snowden, Ewan MacAskill, facebook, festival, film, Glenn Greenwald, information, international, internet security, interview, Joseph Gordon-Levitt, Laura Poitras, leaks, Lindsay Mills, Mark Zuckerberg, Melissa LEo, movie, NSA, Oliver Stone, preview, review, Rhys Ifans, Shailene Woodley, Snowden, social media, software, Tom Wilkinson, US, WikiLeaks, Zachary Quinto. In the few years that I have been watching films it is a rare occasion that a film would receive an ovation at the end of the performance. This was the case during a recent preview showing of Snowden. The latest Oliver Stone written and directed dramatization of actual events was shown as part of the 60th BFI London Film Festival. The film, starring Joseph Gordon-Levitt as Edward Snowden and Shailene Woodley as Lindsay Mills, Snowden’s girlfriend, depicts the events that before and shortly after the shocking reveal of 2013 that the US government is spying on their citizens. The events are presented in an interview format between Snowden and the group of The Guardian journalists Glenn Greenwald (Zachary Quinto), Laura Poitras (Melissa Leo) and Ewan MacAskill (Tom Wilkinson). The events recorded in the interview span from Snowden joining the US army and his years as a CIA and NSA operative, where he helped build software systems with simple tasks like data backup in the case of a hostile takeover of an embassy. The main points the film is carrying throughout concern internet security and the impact a particular career path can have on family and loved ones. A film such as this does have a slight amount of jargon, yet it never feels out of place or too daunting to understand. It’s tied in well with the progression of the events and presents how easily it is for the government to access this data – the best and also the most recently brought up example is Mark Zuckerberg covering the webcam of his MacBook with a piece of sticky tape. There is some solid evidence in this film, whether it be true or not, that this is an actual threat to privacy: the most worrying example is presented through a very intimate moment between Snowden and his girlfriend. The webcam of that laptop in this particular scene feels almost “Eye of Sauron” like. It sees and records everything from every device in the world that is fitted with a camera creating petabytes of information. And that then gets analysed, categorized, and used in predicting who might be a potential threat to the security of the mighty US of A. And it’s moments like this one that slowly change a Republican patriot Snowden in to the liberal man who opened the eyes of millions across the world to the crimes committed by the US government. Snowden’s growing disbelief at the degree of how much governments spy on their citizens reaches its boiling point when his mentor Corbin O’Brian (Rhys Ifans) reveals that even Snowden himself is monitored using the tools he [Snowden] created. And throughout the movie, all of Snowden’s creations feel like Frankenstein’s monsters, being mutilated by others and which Snowden decides to stop. That innocent piece of software designed to back up data was in the end a tool to immediately assess potential terrorist threats and drop Hellstorm missiles on potentially innocent people from a drone. It is difficult to assess the performances of all the actors in a movie like this as there is a lot to take in in the 2 and a quarter hour runtime. Still, every casting choice was spot on. 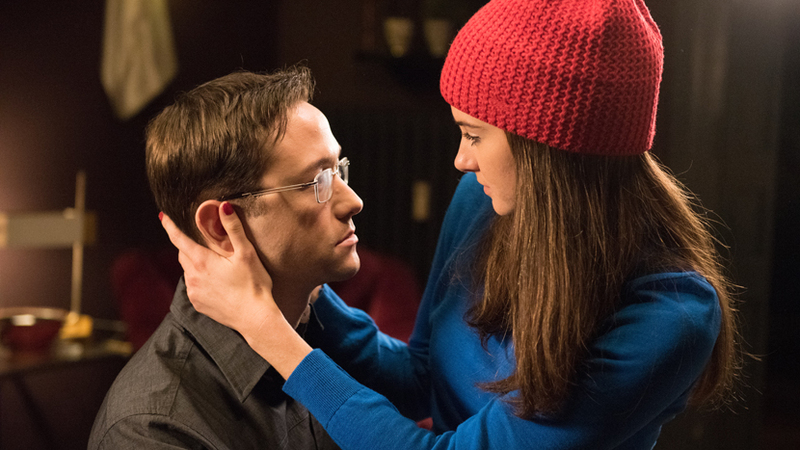 Gordon-Levitt shines as Snowden in this, no doubt. Credit goes to Woodley for several instances when her character goes through the difficulties of trying to empathise with the mental and physical problems Snowden is going through. They are able to show how they both mature as adults, and eventually learn to support each other and live with those difficulties. In terms of cinematography, there are certainly moments that steal the show like the moment with the webcam described above or the moment when Snowden leaks the information. Oliver Stone knows how to build, for particular scenes, an atmosphere just through camera movement. Moments of tension are usually followed by somewhat hectic (in a good way) camera movements to mimic the nervousness the characters feel. It is difficult to talk about this without giving away more details of the plot, and it is not the techniques but rather the story that feels more important here. The event outcome is not a surprise, of course. It is the reasoning, and the effects it has, to such heroism, or a punishable-by-death crime – that is what drives the film, and it succeeds. What the future holds is unknown, but a man like Edward Snowden is definitely going to be mentioned in the history books. Snowden is out in the UK on 2nd December.